Transport your precious bundle with flexibility and versatility without compromising on style with the new Double Trouble Single Pram. This pram together with the market leading brand of car seat, Maxi-Cosi, provides a multifunctional travel system with the ultimate safety standard that can be used from birth. Rain covers are ideal for keeping your little ones dry. It is also a great wind breaker. 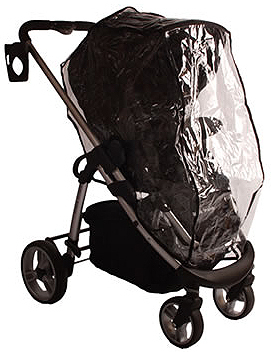 The rain covers are made from clear PVC so that your baby doesn’t miss out on those long strolls. We offer you various packages that provides you and your babies with the ultimate in safety, protection and practicality. Starting with a twin pram, add your desired extra items such as the carrycots, carseats and bases. Transport your precious bundle with flexibility and versatility without compromising on style with the new Double Trouble Single Pram. This pram together with the market leading brand of car seat, Maxi-Cosi, provides a multifunctional travel system with the ultimate safety standard that can be used from birth. Attaching the car seat is made easy with the use of car seat adapters that are included with each pram. Provide the ultimate in comfort for your baby by installing a lie-flat carry cot that comes complete with a removable mattress and integrated sun canopy. The flexibility of forward and rearward facing seat modes has so many great benefits, giving you versatility of choice and catering for all your baby’s needs. The toddler seat reclines with ease for comfortable nap times. With an extra lightweight chassis, easy fold mechanism and the ability to freestand when folded, this pram is an ideal choice for parents with today’s busy lifestyles. Safety of locking mechanisms and adjustable systems. Swivelling or fixed lockable wheels.